Camp can be a life-changing experience. From developing independence and self-confidence skills, to leadership and respect, one summer can forever change a child's outlook on life. But, while glossy camp brochures tout the great positive benefits of the experience, they often fail to take into consideration any negative impact it can glean on the child. That's the premise behind The Lost Girls of Camp Forevermore by Kim Fu. Somewhere in the Pacific Northwest, a young group of girls are sent to Camp Forevermore. Whether it's building up camaraderie with activities that include swimming to camp songs by the fire, on paper these girls seem to have hit the jackpot of a summer of experiences. Except that life isn't that straightforward. The reality is that there is bickering and backstabbing and bullying. One day, they set out on an overnight kayaking trip to a nearby island with a sole adult counsellor. What happens on this trip translates to a lifetime of scars, one that would impact the girls' decisions throughout their lives. The first chapter of the book draws you in with the lives of these girls in those early days. Labelled Camp Forevermore, this chapter gives a snapshot of the relationship between the girls. The chapter somehow gives you the impression that most of the story really centres around a girl called Siobhan. That is a bit misleading. The chapters in the rest of the book, focuses on unique perspectives from each of the girls who were on that fateful kayaking trip. The author chooses to not tell Siobhan's story until the very end of the book. As a reader, this was flabbergasting. The chapters follow each of the girls' lives lives after the incident, although the big caveat is that the incident that seems to have changed their lives forever hasn't been detailed in the beginning. The reader is kept guessing. 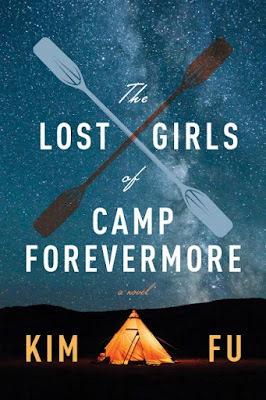 Throughout the chapters there is very little mention of it, although there are hints of a great loss, and suffering because of whatever horrible thing it was that happened at Camp Forevermore. As a reader trying to connect the dots, reading The Lost Girls of Forevermore was incredibly frustrating. A feeling of being misled was constantly on my mind. But I continued to motor on. Reading the life stories of each of the girls as they unfolded. Turns out the Kim Fu has a knack for highlighting the details of her characters nicely. Plus I was desperately hoping that finally the plot of what really happened on that fateful kayaking trip at Camp Forevermore would be revealed. Was it? For me, the story did not come to full closure. There was too much of the "after the incident" verses the incident itself...something I would have thought would be key to understanding the cause and effect relationship of traumatic events. Having read books the likes of The Troop by Nick Cutter, may have made me judge the book critically, as comparisons are not necessarily apples to oranges. Perhaps I came in with preconceived notions of gory murderous stories. Kim Fu is after all the author of For Today I Am A Boy that was described by the New York Times as a "sensitively wrought debut". I didn't read the book, and I am curious as to what fans of her earlier book thought of this one. One final thought...I did read an arc of The Lost Girls of Forevermore (not the finished version), so there is a possibility that the actual story differs vastly from my version...once all the kinks in editing have been ironed out.